Popped to the shops yesterday to hunt out a new wheat free muesli, a few months ago I reintroduced wheat to my diet but have had enough of the itching it causes me so I am back on “Wheat Free” Living (I am also sugar, yeast and dairy free). 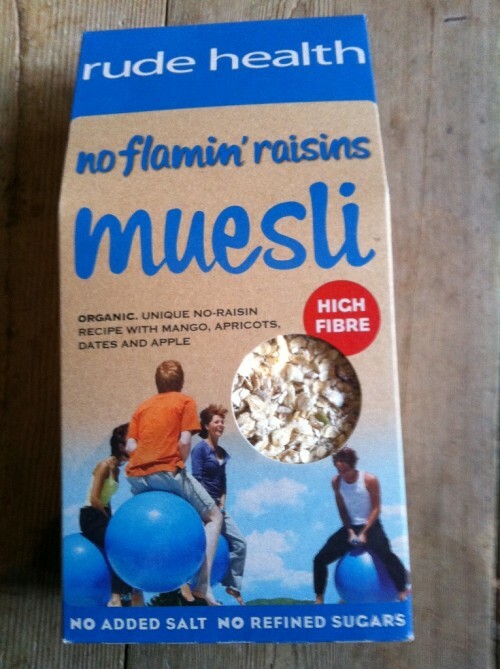 So this morning I excitedly opened my new packet of Rude Health “No Flamin’ Raisins Muesli”. Phil, my partner, also hates raisins and I am not too keen on them either and it’s good to avoid them if trying to exclude sugar from your diet, so it was a delight to see these excluded as well as wheat. Jumbo Oats, Porridge Oats, Barley Flakes, Rye Flakes, Apricot, Mango, Pumpkin Seeds, Brazil Nuts, Dates, Almonds, Apple, Cinnamon. A bowl, some oatly milk and a splash of rice milk (I like to mix it up) and I was ready for the taste test. This cereal is a bit pricey, but it does taste great and so many muesli’s are padded with cheaper ingredients e.g raisins, wheat and MILK POWER. One option to spread the cost of the cereal is to pad it out with a few extra oats and it would be nice with a few slices of banana too. I have really enjoyed the different taste of this morning breakfast so I will be buying again. My only complaint and I don’t know if mine have all slipped to the bottom of the packet but it could do with a few more nuts for an extra crunch so tomorrow I might add those too. Rude Health is sold on their website, nationwide by Waitrose and select Tesco, Co-operative & Sainsbury’s stores as well as health food stores,. Thanks Rude Health for making a raisin and wheat free muesli that is suitable for both my partner and I.
I have to get some of that – I *hate* raisins unless they are mushed up in something (like a Nakd bar)!! !